Supposedly, the actors in the film were not Sàmi themselves, and the setting as well as the stage props were invented. At the time of writing, the Finnish as well as the English version of the debated video are offline and replaced with an apology, but the German and Japanese versions are still accessible. Two years ago at the International Conference of Arctic Social Sciences in Prince George, BC, I gave a paper about the persistence of stereotypes about the Sàmi as being drunk and dirty, and how these images are being reproduced in tourism and society at large (e.g. as postcoards of Uuttu-Kalle, or in the past in popular comedies, for instance pulttibois, https://www.youtube.com/watch?v=lbUFhKuMfCg). At first, the international audience at the conference could not believe that the images I was showing were actually available, such as the post card of Uuttu-Kalle, on sale in local supermarkets in north Finland. Instead, the audience seemed to think that I was talking about representations of the Sami in the past. 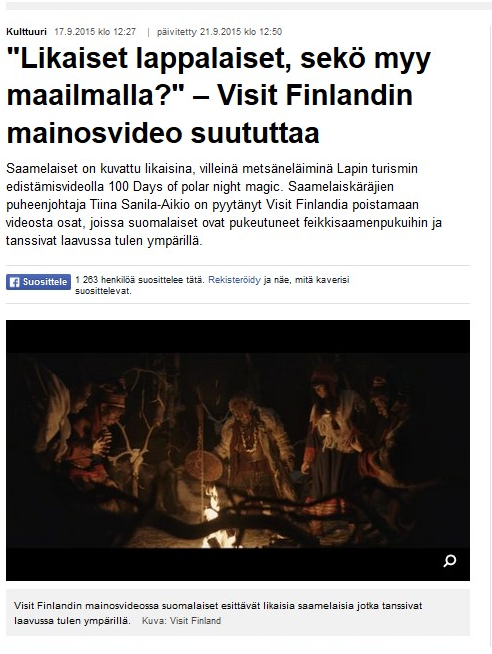 The video now broadcast by Visit Finland – the national tourism enterprise – and Finnair – the national airline – is yet another reproduction of that popular, persisting image and, as the president of the Sámi Parliament Tiina Saanila-Aikio mentions in the YLE interview (“Likaiset lappalaiset”,YLE 17-09-2015), all attempts that have been made in the past two decades to raise awareness of its problematic implications seem to have been in vain. Agreeably, a step forward in getting rid of the stereotypes would be to follow Tiina Sanila-Aikio’s advice and film real Sàmi in their daily activities (“Likaiset lappalaiset”, YLE 17-09-2015). However, a wider societal effort is required to change this understandings and attitudes and that should span across all national public institutions, starting from schools. In addition, it is interesting to notice that among the foci of the discussion, dirtiness figures as a main point of criticism. From a theoretical perspective, but also on a more pragmatic level, such debate conveys a very urban understanding of cleanness/dirtiness, a division that bring us to the structuralist analysis as with Mary Douglas where she remarks that “Dirt is the by-product of a systematic ordering and classification of matter, in so far as ordering involves rejecting inappropriate elements”(Douglas, 2003:36) and hence refers to other symbolic taxonomies . On the contrary, in a real Sàmi lávu, or any other teepee/chum condition, face and hands marked by the ashes would not be regarded as dirty, but as Ingold would have it, ” inheres in the pattern of dwelling activities that I call the taskscape” (Ingold, 1993:153), in other words, it would be understood as a sign that one has been taking care of the fire within a daily nomad taskscape and we all know that the fire has a central “focus” for the survival in the tundra. This entry was posted in All, Indigenous Peoples, Sámi, Theoretical Issues. Bookmark the permalink.